July 24, 2016 By Allyson 1 Comment This post may contain affiliate links. Read my disclosure policy. 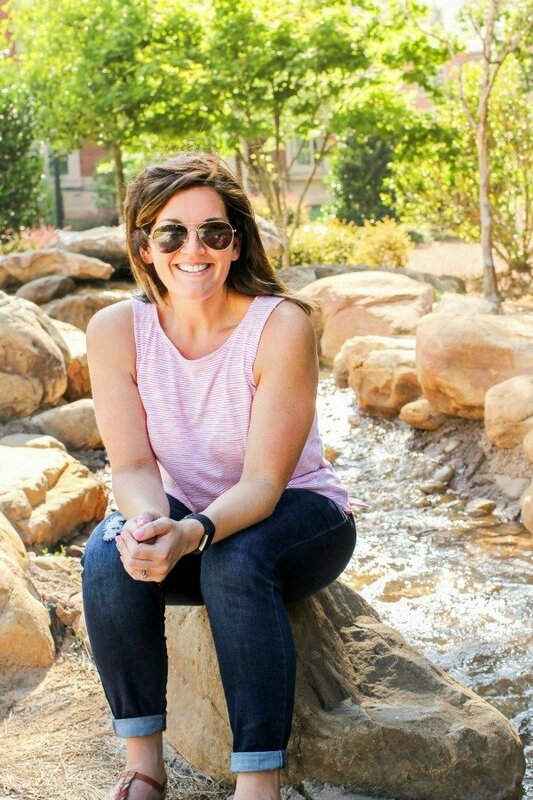 Since we are in the middle of summer, we have been utilizing our grill as much as possible, and I’ve been having a great time coming up with fun recipes for summer. 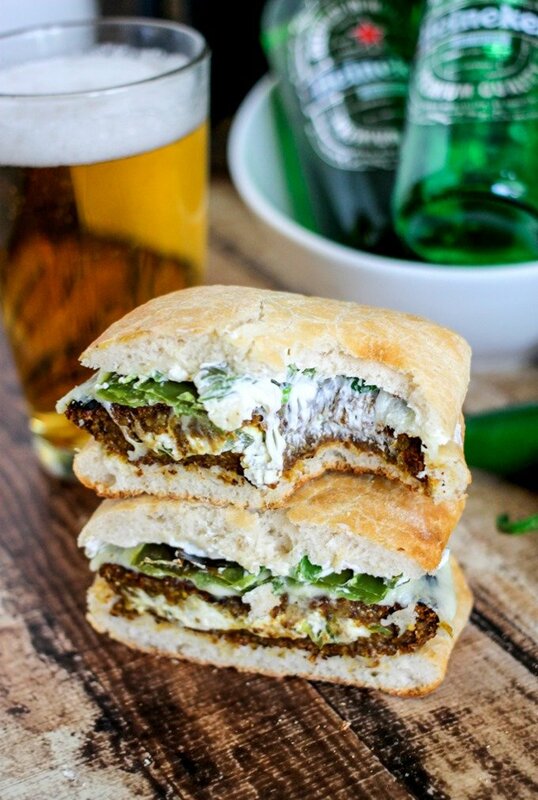 I decided to make these Jalapeno Popper Stuffed Black Bean Burgers a few weeks ago, and of course paired them with Heineken when serving them to our guests over the weekend. 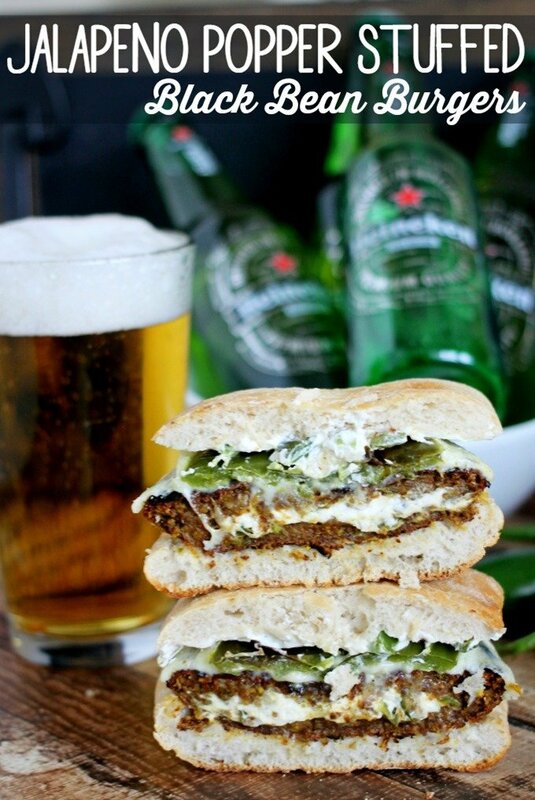 The creamy spiciness of these mouthwatering burgers, paired with the three main ingredients of Heineken, barley, hops and water, are a match made in heaven! 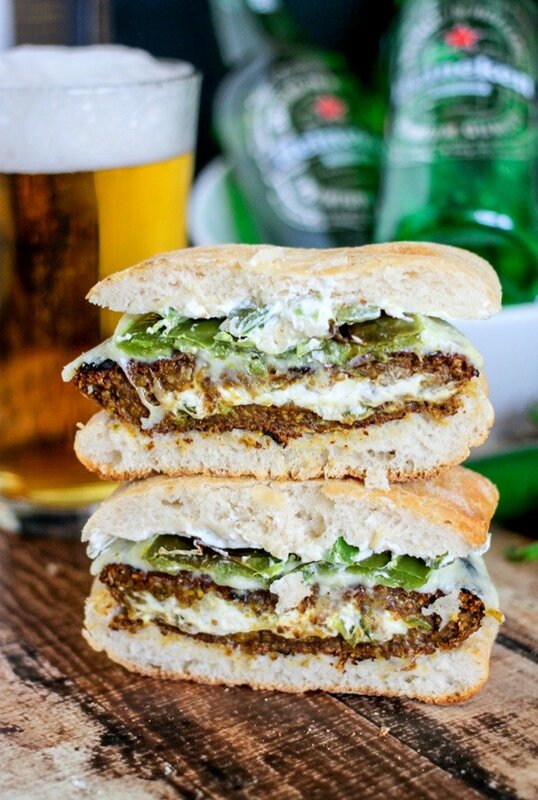 Jalapeno Popper Stuffed Black Bean Burgers are the perfect way to kickoff your weekend. 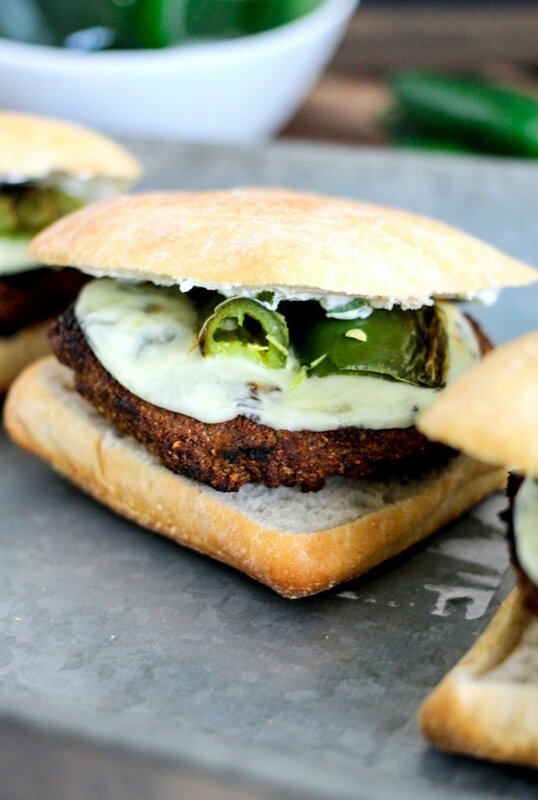 We are vegetarians, so we love making black bean burgers, but you could also make this recipe with beef. Just make the filling and stuff it in there – then grill it up! It’s really simple, and your guests will think you slaved over this for hours…little do they know! I topped these with provolone cheese, but any cheese would work, and then slathered on some of the left over cream cheese/jalapeno mixture. Let me tell you, these were nothing short of decadent and majorly delicious. 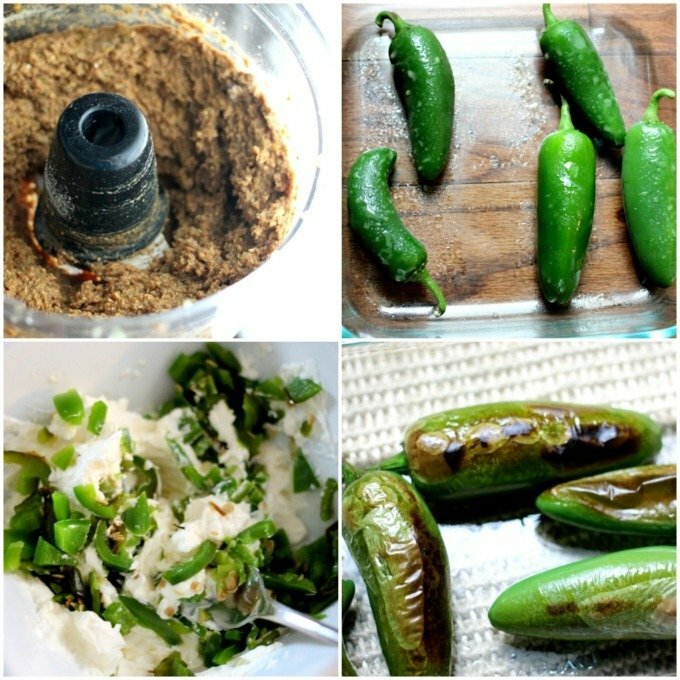 You are going to ‘fire-roast’ your jalapenos for this recipe, which can either be done on the grill, or under the broiler. I did mine under the broiler, and it took about 10 minutes. Just set that bad boy on high and let it do its thing. The skins will get charred and when they are blackened you know they are ready to come out. Dice them up and mix them up with some softened cream cheese. This is what you will stuff into the burgers, and then save a little bit to slather on your rolls. I put about 1-2 TBS of the cream cheese mixture in the middle of the burger, then covered it with some more burger mixture. Make sure you press down on the sides a bit so it doesn’t come oozing out when you cook it. 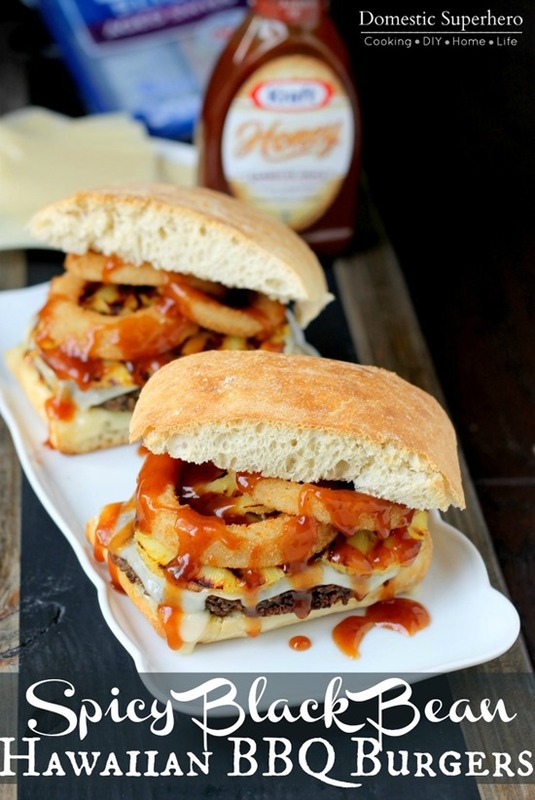 My friends absolutely loved theses burgers and what better time to share good food and drinks than summer?! Since everyone coming to our house is a big fan of spice, I decided to top the burgers with a sliced jalapeno as well. Since they are roasted, they aren’t quite as spicy as uncooked, but if you don’t like a lot of spice, then go ahead and leave these off. 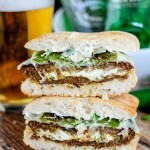 The best part is when you bite into these Jalapeno Popper Stuffed Black Bean Burgers and are surprised by the creamy spicy layer in the center. It’s SO good! Put onion, jalapeno (1) and garlic into a food processor and pulse for a few seconds. Add beans, oats, corn, green onion, cumin, curry powder, and cayenne pepper. Add breadcrumbs and pulse for about 20 seconds or until fully mixed. Scrape downs sides of the bowl and process for 10 seconds. Preheat oven broiler on HIGH. Place jalapenos (6 total - 2 for cream cheese mixture and 4 for topping) in oven safe baking dish, and brush jalapenos lightly with olive oil. Place into oven and broil on high for about 10 minutes or until skins are slightly blackened. Set aside. In a small bowl, combine softened cream cheese and 2 diced roasted jalapenos, set aside. Form black bean mixture into four small equal patties (using a 1/3 cup measuring cup works well), make an indentation in the center of the patties, then add about 1-2 TBS cream cheese mixture. Add a bit more black bean mixture of the top and press sides to seal (see photos). Preheat grill on medium high heat. 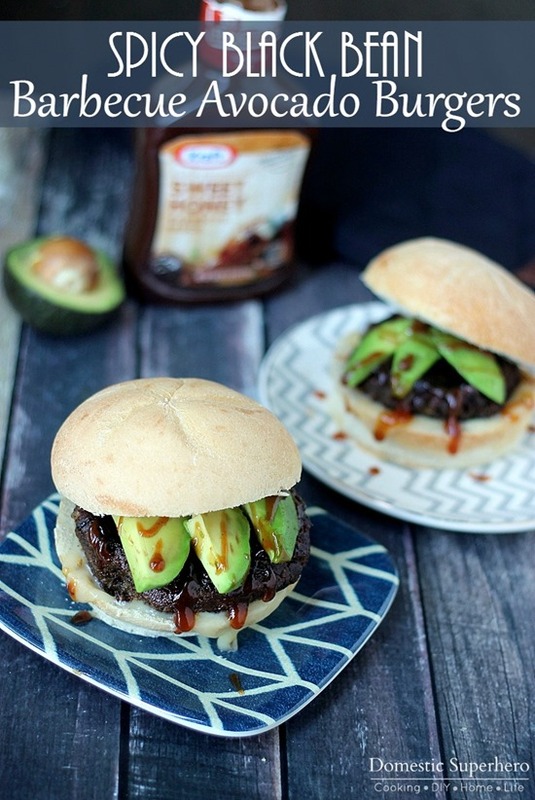 Using a grill tray (or you will have a mess on on your hands), sprayed/brushed with olive oil, set the burger patties on the tray, and place onto the grill. Close the lid and grill for about 8 minutes. Flip patties over and close lid, cooking for about 5 more minutes, or until crisped. 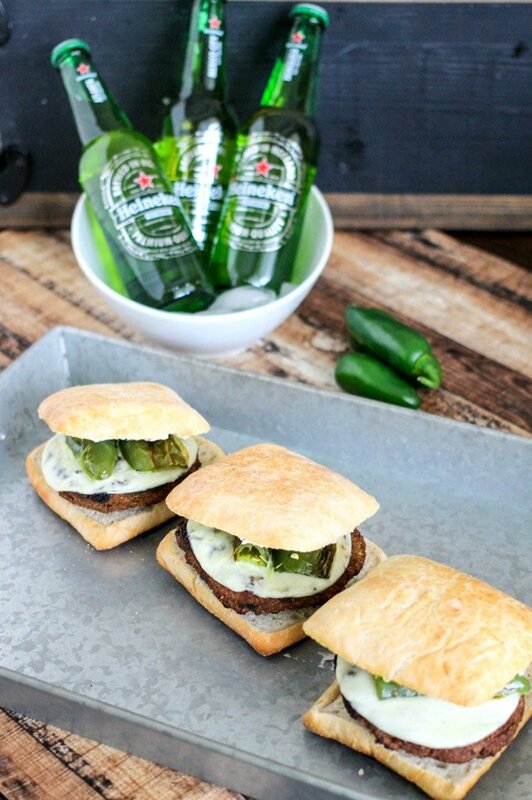 Place burgers on rolls, add cheese and sliced jalapenos if desired. 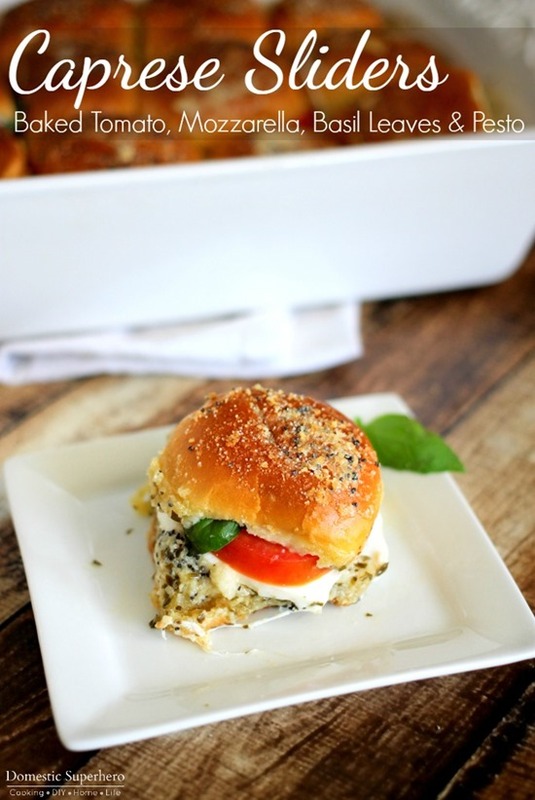 Spread about 1 TBS of cream cheese mixture onto the roll, and close the burger. 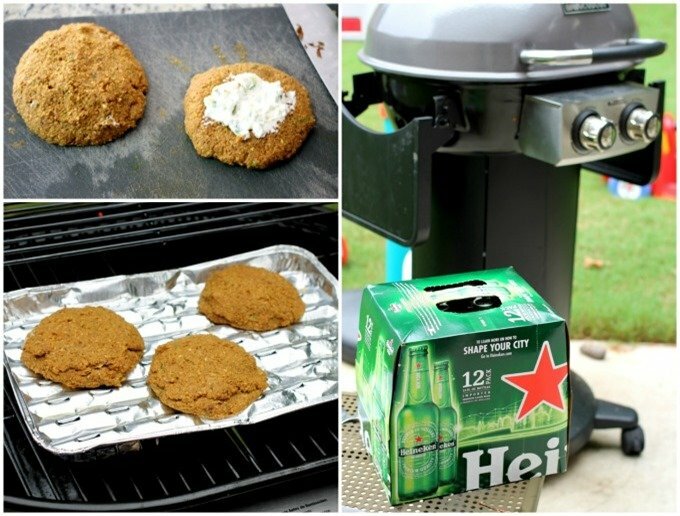 Serve immediately with Heineken!